As part of the update series of sub-communities of @steemstem, this week we want to present to the Spanish-speaking scientific community #stem-espanol. They have been an active part of the larger steemSTEM community for seven months and have shown great growth and development in the promotion of STEM content on the blockchain. The reason for the creation of stem-espanol was to promote scientific publications in Spanish. @carloserp-2000 came up with this idea at the end of last year hand in hand with @iamphysical and weeks of planning together with the directive of @steemstem, this project was born on January 12th of this year, acceptance was immediate and many users of the Spanish-speaking community decided to join the main channel in discord and show their support for this wonderful project that, together with their excellent publications, has played a role in the growth of this sub-community. Since its creation, the administrators of #stem-espanol have worked tirelessly in search of the consolidation of this project, which together with the management of #steemstem and the support provided have made this sub-community one of the best known on the STEEM blockchain. It is not just about looking for high quality scientific content written in Spanish, but about creating activities and encouraging community members to feel comfortable being part of #stem-espanol. Because the community grew very quickly and we planned to do different activities, we met at the beginning of April to create the main server of the STEM-Espanol discord. Its purpose is for users to feel comfortable interacting, and also contains several chat channels from different areas of Science, where everyone can discuss their common interests; in addition there are specific channels for suggestions and questions about the STEM community. It also has an intelligent Bot that not only greets new users, but also performs important tasks within the server, such as "answering" some questions related to the project; above all the bot serves as a great help and guidance for those new users who are dabbling in the community. One of the most important community activities that exists is the one that takes place every Thursday of each week called "Virtual Conversation",where an active user of the community has the opportunity to share a topic related to Science, Technology, Engineering and Mathematics. This has been a big success! The dynamics is simple, each user must connect to the voice channel and listen to the speaker talk about the topic chosen by him and listeners can make their questions in writing in the conversation channel. STEM-Espanol has a group of people specialized in each scientific area, this group is called "Area Collaborator", and they are in charge of guiding, informing, attending and clarifying any questions that a user may have concerning the community. They manage each area sub-channel and share ideas with the other users of the server. Their help is paramount for the managers of @stem-espanol. 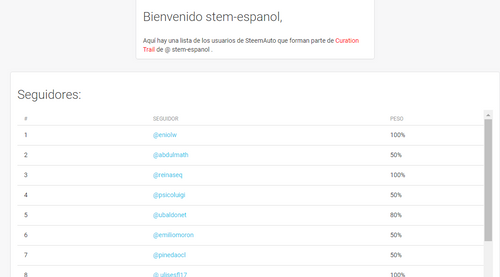 Since mid-June, our sub-community independently manages its own account on Steem with the username @stem-espanol. As of its creation, this account has been used to publish a detailed report on the curation process of each week, showing the statistics of the users supported by #steemstem and the Podium of the 3 best publications of the week, it should be noted that the Podium is chosen by the users of the active community of # stem-espanol where they freely vote through a survey page the publication of their preference. There is also an article with an audiovisual report, created by one of the collaborators of #stem-espanol, where a summary of the Podium of the week is shown. In the same way each relevant publication is resteemed by the account @ stem-espanol. If the publications meet the criteria of #steemSTEM, they will be sent to the steemSTEM curation team. Once reviewed, they will receive our generous vote to support the diffusion of knowledge and dedication to show content of current scientific-technological interest and quality. As part of the growth and innovation plan of our community, a few days ago the official trail of @stem-espanol was created through steemauto. Any user can join the trail and will be supporting the healing process, since they will vote for those items that @stem-espanol vote, which also has added value, that you will get healing rewards completely automatically. We always try to innovate, since our project tries to copy itself, but they can never match it, so we are in a stage of selecting the logo of each STEM area, we have planned to make a presentation of each user in an article called About @usuario and set a day for the pleasant discussion of various topics, ie; an "Afternoon coffee and something more". The idea is to encourage the participation of new users who write in Spanish and to contribute their scientific knowledge for the consolidation of our community #stem-espanol. In the same way there is the possibility of a meetup with the active members of the community. This meeting is being planned but we still do not have a date - stay tuned for more information! ¿Qué esperas?, forma parte de nosotros! ¿Tienes conocimientos científicos?, ¿hablas español?, te gusta leer, escribir e interactuar, entonces no esperes más y únete a nuestro canal en discord y de seguro nuestros amigos te atenderán cordialmente. Thank you very much for all the support from the scientific community of steemstem, we hope to continue on the right track and grow with the help of all the members of the community the speaking spanish. Undoubtedly @steemstem is the most respected community of steemit and I dare say that the most popular, thanks to their hard work, dedication and transparency we will be pioneers in the block chain. In the same way, I would like to thank immensely @lemouth, @justtryme90, @mobbs and the rest of the STEM board for all the support provided in these 8 months of unforgettable and wonderful work. I am very happy to be part of this great team, I hope there are many more months of nice work with steemstem. And I thank you for all the time and effort you have put in to growing stem-espanol! Congratulations, to the direct creditors @ carloserp-2000 and @iamphysical of these merits of sustained growth during these 8 months, unquestionably # Stem-espanol, is the academic reference community, which along with #Steemstem have managed to position themselves on the platform STEEMIT, in particular, I appreciate the constant support that # Stem-espanol offers to the contents that I socialize, in addition I must indicate that the team of coordinators are also fundamental pillars in this visible consolidation of this great community. Greetings to all, let's keep growing. I am very pleased to belong to @stem-espanol, it is a community that seeks to strengthen the knowledge through the diverse contents of its collaborators as well as the integration between them. Congratulations to the Spanish team. Welcome to the fold. Thumbs up to the Spanish team. Your contributions to the development of steem is unbeatable dear team @steemstem. We want to let you know that the community appreciate you. Thanks for your support to the hard working members of the wider community. Excelente, felicitaciones a @ carloserp-2000 y @iamphysical por la valiosa iniciativa que ha permitido la integración de la comunidad científica de habla hispana en Steemit, cada día en crecimiento! Valoro mucho el talento humano del equipo y sobretodo el apoyo que nos brindan, me encanta formar parte de esta bonita comunidad, abrazos para todos!! I do hope someday there will be community curators for South East Asian subcommunity. With that, steemSTEM might be able to support more languages. thank for your sharing !